Samson, judge and champion of Israel in his lifetime, is probably the most well-known character from the book of Judges. The book talks about a dark period of time for the Israelites, where after the death of Joshua, there was no clear prominent successor like he was to Moses. God raised judges to lead and save the Israelites time and time again, yet after the death of each judge, the Israelites would spiral into a cycle of forgetting and turning back against God, before suffering comes and another judge saves them again. Perhaps that was the life, too, of Samson the Judge. Born of a great promise between his parents and God, he was set apart from birth as a Nazirite, meant to deliver Israel from the hands of the Philistines [Judges 13:5], grew with the blessings of the Lord and the Spirit of God stirring in him [Judges 13:24-25], possessed great strength, but gave in to temptations and revealed the secret of his strength. He was captured, suffered, and through his pain he found God again. This is the story of Samson at his last, captured, blinded, and desperate to do as a judge should – deliver his people. In this study, we will focus on the phrase – ‘just once more’, and how the mercy of God manifested itself in the final act of Samson. Samson prayed to the Lord – Flip through the chapters on Samson and you’ll find that, throughout the four chapters that depicted the life of Samson, this was the only time he prayed to the Lord. Well, there was once other when he cried out to the Lord, but that was more like a demand of a proud and strong person rather than a prayer of someone who knows that he can only depend on God – Because he was very thirsty, he cried out to the Lord, “You have given your servant this great victory. Must I now die of thirst and fall into the hands of the uncircumcised?” [Judges 15:18]. Maybe it simply wasn’t recorded, but this pattern is pretty much that of a man in power, isn’t it? He had everything he wanted, was adored by the people for his great strength, and knew that he was special – should he cry out to the Lord, God would answer. He was a man with great strength, and time and time again, he relied on his great strength instead of the Lord who gave him that strength. It was only until adversity came, that he learnt how to rely on God. Sovereign Lord, remember me – According to Judges 16:20 [Article], God had left him.The Lord whose Spirit was stirring in Samson since he was born, had left him. It was the first time for Samson, and it must have been a harrowing experience to suddenly lose something you had always taken for granted. Yet the Lord never forgets – the Lord cannot forget his servant, and perhaps Samson had faith about that too. Please, God, strengthen me just once more – How sad is this. How poignant is this. Here was a hero knowing that he had fallen from his heights of glory, knowing that his end is near, knowing that he has failed his God and failed his people. He was blinded, captured, and defeated in humiliation. Yet he saw a chance to do what he had always done best – to destroy the Philistines. But he needed that superhuman strength which he no longer possessed, and so, he begged God for it. Just once more. Just this time. And that is enough. Samson would have known that what he was planning to do would cost him his life. 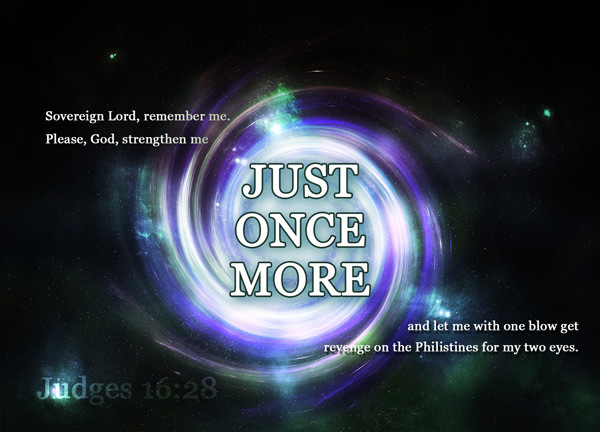 Yet he pleaded not for strengthen me again and again; but just once more. It’s like facing the genie from the magic lamp and just asking for one thing even though you can ask more. Samson knew it was his last, and he went back to what he was always meant to do – deliver his people from the Philistines. Even though Samson was a failure, and had failed to deliver the Israelites, God regained his strength. Even though he died, he had fulfilled his role in life – deliver his people from the Philistines. His good and blessed life had led him into great complacency, and the Spirit of God that had always been dwelling in him left him. But our God remembers. Psalm 16:10 – because you will not abandon me to the realm of the dead, nor will you let your faithful one see decay. Ultimately, Samson killed many more when he died than while he lived [Judges 16:30]. God gave him victorious glory with his prayer of ‘just once more’. It was a prayer that signified his desperation. When we are pushed into a corner, when our backs have reached the wall, when we know that we have no-one else to turn to except for the Lord, and that we can no longer rely on our own strength – and we are more than satisfied in asking the Lord for ‘just once more’ – that is when our faith really grows. But, isn’t it sad to have to go through a tragic fall before we come to rely on God? I love the application you have at the end. So true!